Sepro Group (La Roche sur Yon, France), with its Italian distributor Sverital S.p.A., will exhibit at Plast 2018 (Pad. 22 / booth C/D 61/62) and present two new small robots. The Success 5 is the newest and smallest in Sepro Group’s range of economical, general-purpose Cartesian robots for injection molding and the 6X-70L, one of three new small 6-axis articulated-arm robots. They represent the company’s broad range of robots for small molding machines up to 500 tons of clamp. The new Success 5 is now available to equip machines up to 80 tons. Like all Sepro Success robots, it is equipped with a standard R1 pneumatic (0° – 90°) rotation, but offers an optional R3 rotation (0° – 90° or 0° – 180°). For more technological applications, requiring higher speeds and more complex part manipulation, Sepro offers the S5 Line of 3-axis robots and the 5X Line of 5-axis robots. Continuing its already-successful product-development collaboration with Yaskawa-Motoman, Sepro Group (La Roche-Sur-Yon, France) is expanding its 6X Visual family of robots. The 6X-70L on display at Plast Milan, has an 895-mm reach and a 5-kg maximum payload. It is one of three new small 6-axis units recently introduced for molding machines with up to 500 tons of clamp. Like other robots in the Sepro-Yaskawa line, the new models are designed as general-purpose workhorse robots, providing an attractive balance of power, efficiency, agility and economy. 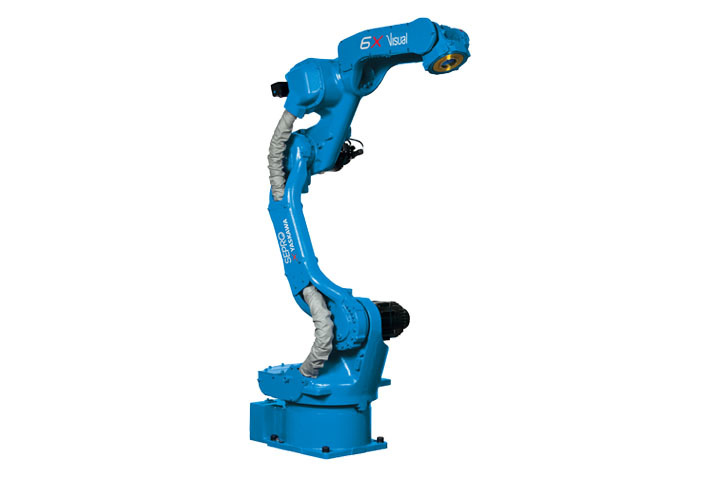 The Sepro 6X Visual product line also includes other 6-axis articulated-arm robots produced in partnership with Stäubli Robotics. Four models suit molding machines from 20 to 1300 tons.